Glenwood Springs Demon Luke Gair lunges forward while Conifer Lobo Stephen Douglas makes the tackle during Firday night's game at Stubler Memorial Field. 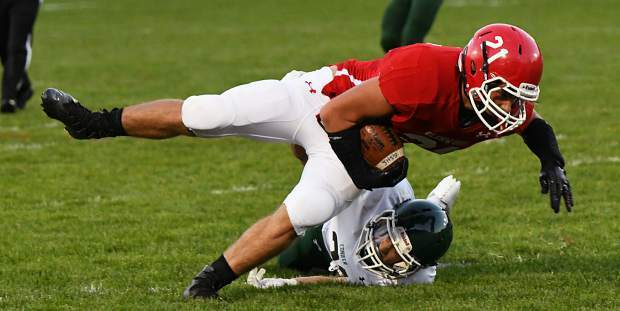 Glenwood Springs Demon Elliot Dwyer-Walz leaps forward to aboud the tackle during Friday night's game against the Conifer Lobos at Stubler Memorial Field. 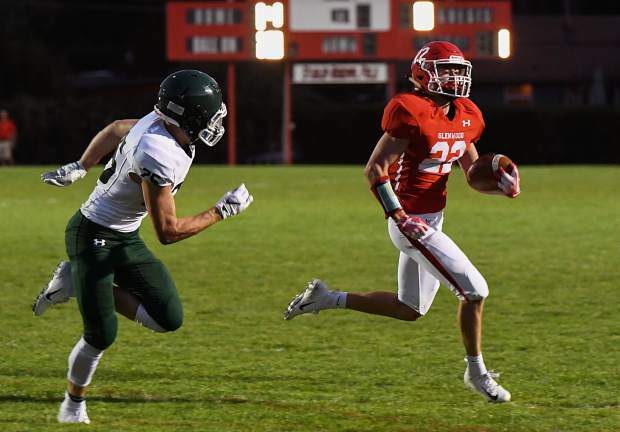 Glenwood Springs Demon Gavin Olson runs the ball past the defending Conifer Lobos to score a touchdown late in the first quarter during Friday night's game at Stubler Memorial Field. Glenwood Springs Demon Gavin Olson runs the ball down the field through the defending Conifer Lobos during Friday night's game at Stubler Memorial Field. 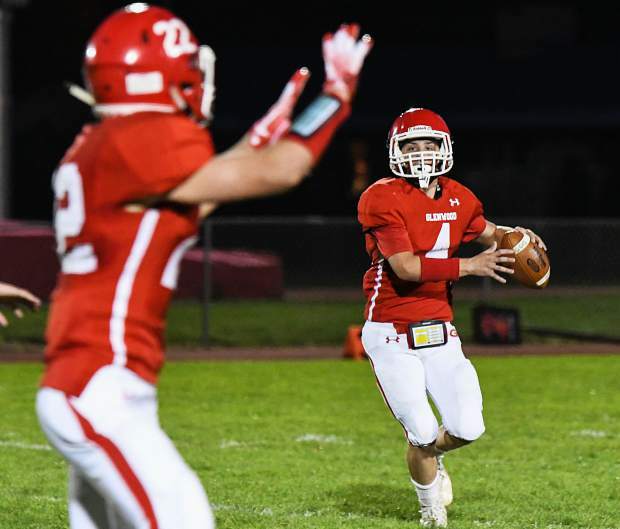 Glenwood Springs Demon quarterback Dylan Albright looks to pass the ball to the receiving Demon Gavin Olson during Friday night's game against the Conifer Lobos at Stubler Memorial Field. 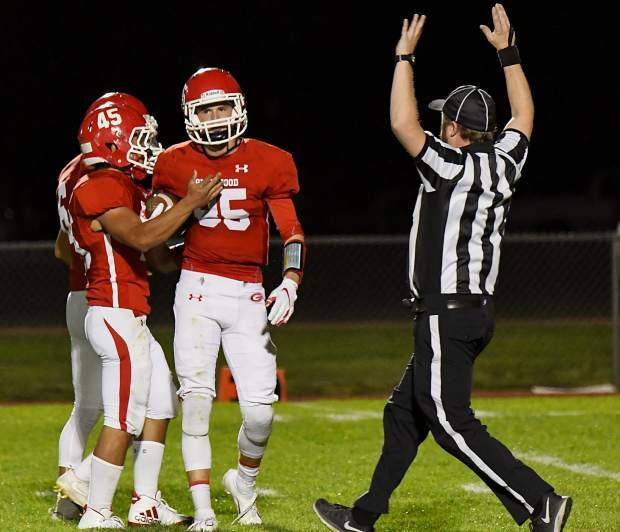 Glenwood Springs Demons celebrate at Wyatt Ewer comes up with the interception late in the first half against the Conifer Lobos on Friday night at Stubler Memorial Field. 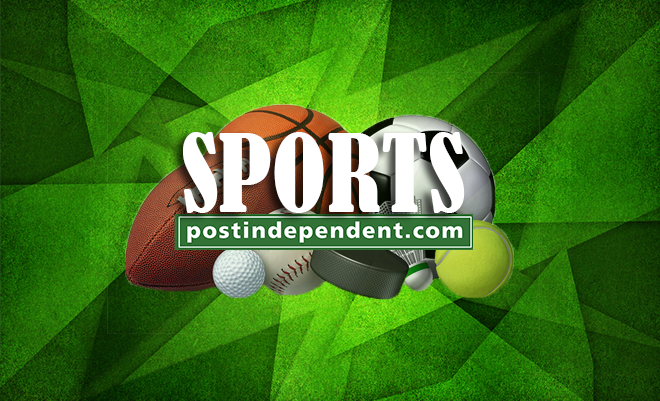 On a warm Friday evening that felt a bit more like summer than fall, the Glenwood Springs Demons took care of their football business by defeating the Conifer Lobos 41-20 to garner the first win of the 2018 football season, and the first victory of the Pat Engle coaching era in Glenwood. Conifer won the opening coin toss and chose to kick the ball off to the Demons. It was a decision the Lobos would quickly regret, as Glenwood senior tight end Wyatt Ewer gathered the ball in at his own 7 yard line and raced up the middle of the field before breaking toward the right sideline en route to a 93-yard touchdown gallop. The PAT by Sebastian Torres was good, and the Demons were up 7-0. 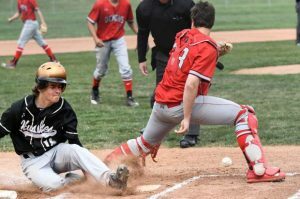 After shutting down the Lobos on their initial possession, Glenwood would strike again to extend its margin. The legs of Demon runners Luke Gair, Elliot Dwyer-Walz, and Gavin Olson would set up Glenwood at the Conifer 36 yard line. From there, senior quarterback Max Lemkau took a keeper around the right side of the line and proved to be like trying to grab a comet by the tail. Lemkau zigged and zagged his way around all Conifer tacklers, finally diving into the end zone to put the Demons up 14-0 as Torres was perfect with the point after kick once again. Conifer quarterback JR Hart, and the rest of the Lobo offense had trouble getting untracked against the stingy Demon defensive eleven. The first quarter alone saw Glenwood rush for 110 yards, to just 6 yards on the ground for Conifer. 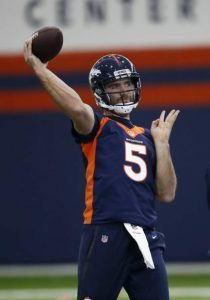 Hart tried to connect with Lobo receivers six times in the opening stanza, but failed to get a completion on any of the attempts. 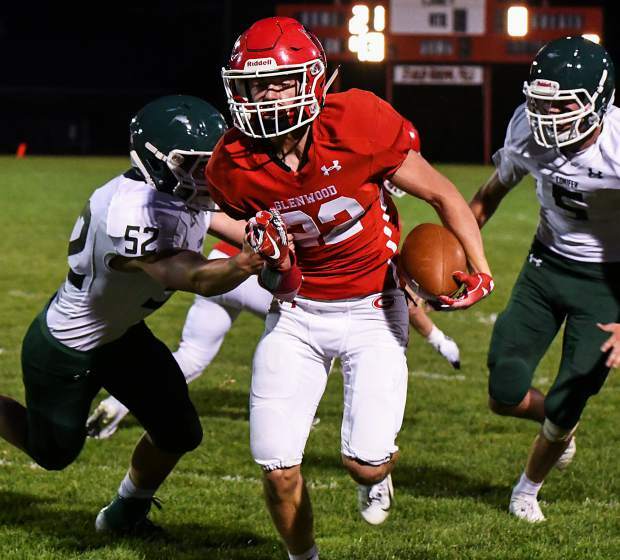 Glenwood’s big red machine kept chewing up ground yardage and extended the lead to 21-0 at the 10:30 mark of the second quarter when the senior speedster Olson broke free around the left end for a 10-yard touchdown and a comfortable Demon advantage. Conifer got on the board late in the first half, as Lemkau was hit on a pass attempt and the ball floated high into the air, eventually landing in the arms of a Lobo defensive back. 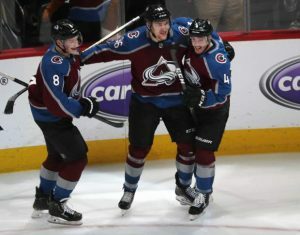 Hart’s arm then began to heat up for the Lobos as he connected with junior receiver Sam Horneck on consecutive passing attempts to move the ball closer to the Demon end zone. Senior tailback Rocko Fillweber got the Lobos on the scoreboard with 1:21 until intermission as he banged his way to a touchdown from 3 yards out. The PAT attempt went under the crossbar instead of over it, and Conifer trailed 21-6. Glenwood would strike first in the second half when senior Joshua Sanchez took a swing pass from Lemkau and scampered 43 yards deep into Lobo territory. Gair would finish up the nine-play, 64 yard drive with a 2-yard plunge through the heart of the Conifer line for a score. Glenwood now led 28-6 with 6:20 to play in the third quarter. Conifer’s offense started to get untracked more and more as the game wore on. Hart found favorite target Sam Dunivan to move the ball toward the Demon goal line. 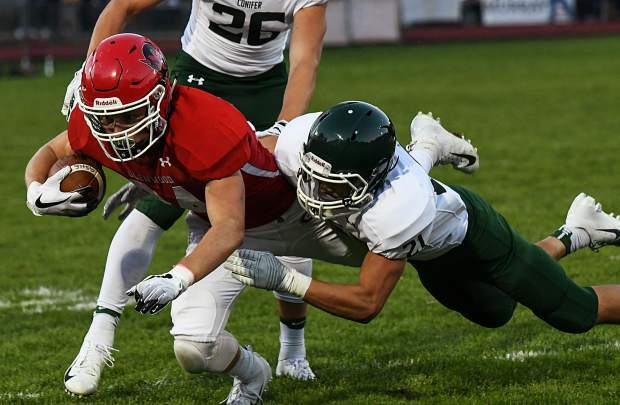 Helped by a holding call on the Demons that nullified a sack of quarterback Hart, Conifer’s Fillweber scored from 11 yards out to give the Lobos some hope at 28-13 following the PAT by Graham Dickson. Glenwood’s kickoff return ace Ewer went to work again, proving to dig a hole that the Lobos would never get themselves out of. Ewer rumbled 60 yards this time, up the same right sideline to set up the Demons in prime position. Olson took over from there on the very next play to score untouched on a left side sweep to put Glenwood up at 34-13. Conifer would tack on a rushing touchdown in the fourth quarter to put the margin at 34-20, but Glenwood responded with a touchdown of its own as Gair would get his second rushing score of the evening to put the finishing touches on the Demon victory. The Demons (1-2), will next face the undefeated rival Bears of Rifle on the road next Friday night.